u must be wondering if i bought the books. well, part of it is true. i did buy the books, but they are e-books. found it while browsing stuffs online. can't believe i found it. I've been a fan since i saw the first muvie last year. initially cudn't understand all da buzz. i thot the muvie was just average...till i read the craziness on the net. It's big in US. fans are crazy bout them. but that still didn't drive me to read the books. only after i watched new moon few weeks back, i was really into it. initially, i wanted to pass, since i don't want to keep comparing the books and muvie but the temptation is too great. furthermore, i just wanted to understand each character in the book. in da muvie, only certain characters are high-lited, others are ignored. 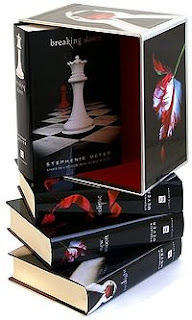 while reading twilight, it kinda bring back memories when i was in hi-school. i read a lot in hi-school. i particularly love books bout vampires especially written by christopher pike. to me, he's the original author who brings vampires to life.